I'll be honest, I don't like pictures of myself, so I don't do a lot of 'selfies'. 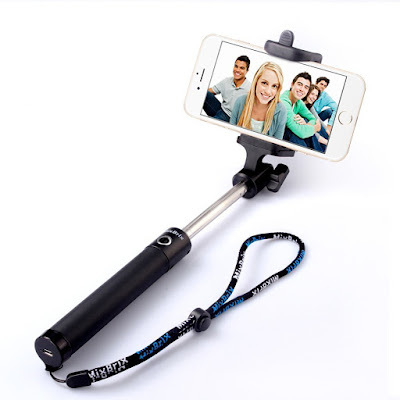 However, these selfie sticks are very popular right now and I've been curious to try one. 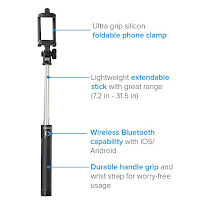 So, when I got this chance to review this [2015 NEW RELEASE] Quick Snap 3-In-1 Selfie Stick, I was very excited. When it first arrived I was a little disappointed in the packaging. The box was a little beat up. I was hoping that wouldn't affect the condition of the product. I was glad it didn't. The company should next time package and protect their product better. Anyways, the stick itself is thicker than what I was expecting, which made it sturdier. I like that because it made it easier to take a picture without the stick wavering as I held it out. I also liked how it collapses nicely to a smaller size, making it easier to carry and travel with. It did fit my Samsung Galaxy S5 good, however I had to take the case off first, which can get annoying. The Bluetooth was pretty easy to connect and set up. I pretty much figured it out on my own from previous Bluetooth devices. It does come with charging cable, but it's pretty short. 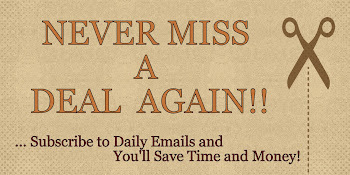 I wish it was a bit longer. 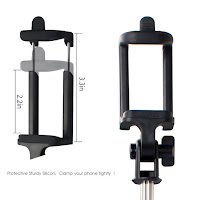 Overall, it's a good selfie stick and it's fun. I never really got the appeal of 'selfies' but I do like it because it does allow me to get into the photos with my family more often now. I'm usually the one taking the pictures. 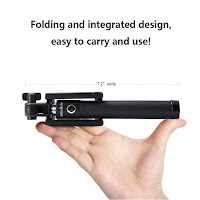 If you would like to try this Mixbrix® Ultra Compact Foldable Quick Snap Pro 3-In-1 Selfie Stick for yourself, you can purchase it right now from Amazon!